Torquay United striker Tyrone Marsh must "grow up" after being sent off for pushing a team-mate, according to manager Kevin Nicholson. Marsh gave them the lead at Altrincham before pushing Dan Butler and receiving his red card with 12 minutes to go. "It's two team-mates having a good go at each other and he's pushed his mate away," Nicholson told BBC Radio Devon. "It's not like he's punched him in the face, he's not punched him round the throat, he's pushed him away." 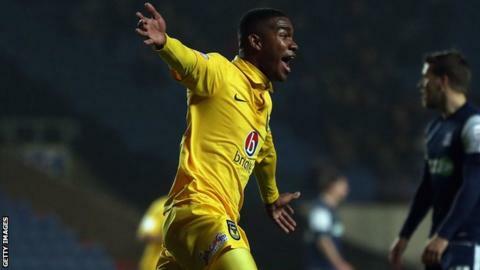 Marsh, 21, joined the Gulls in the summer after being released by Oxford United, and had found a rich vein of form since Nicholson took over at Plainmoor in September, scoring in each of his last three appearances. "Marshy was very good for 80 minutes, but he's got to grow up, he's got to learn, you can't give a referee any opportunity whatsoever with things like that," said Nicholson. "As daft as what it is, it's the first time I've been involved on the pitch when that's happened in 20 years of playing, it's just a bit rash and a bit daft." Nicholson, who is considering whether to impose any sanction on Marsh, feels his side are improving after the 1-1 draw at Altrincham made it four league games without defeat. Torquay are still in the National League relegation places, but only on goal difference. "It's another game unbeaten, it's another point on the board, we're crawling our way back up there and we're showing a lot of good signs," Nicholson added. "I've got work to do this week, they players are going to have a lot more work to do this week, but I would say it's a step forward."